"Redemption" - Part One: "If You Believe A Man Can Fly"
One year ago, Clark tries to get Perry to let him look into a metahuman operating in the country of Nyasir, but Perry says it's too expensive without any proof of this metahuman. Clark's worried about a metahuman becoming involved in religious affairs. One month ago, a group of soldiers in Nyasir threaten a group of missionaries, but the metahuman Redemption moves to protect them. When the soldiers fire on him he responds with an energy blast that obliterates everything around him except the missionaries, killing fourteen soldiers and incinerating thirty-six buildings. Superman arrives on the scene and surveys the damage. Scanning the electromagnetic spectrum, he finds a trail leading back to America and follows it. Superman arrives in a small town in Colorado. Looking into a cottage, he finds Redemption powered down, kneeling and praying with his parents. He asks for forgiveness for not being able to control the power within him because too many people believed in him. Superman can't tell if he's lying or if he really believes that his powers are faith-based. As Clark, he goes to visit the local church. He talks with the Reverend about Jarod, Redemption's alter ego. The reverend tells him that Redemption was dispatched to protect the missionaries in Nyasir. Their conversation is interrupted by the townspeople coming in for the service. Clark stays for the sermon before heading home to Lois. In Nyasir, a group of soldiers take advantage of Redemption's absence and kill the missionaries. When Clark hears the news he heads for the country immediately. He arrives to find Redemption in the process of destroying the city. As he tries to kill a group of soldiers, Superman blocks his fire and tells him that this stops now. Story - 4: Yes, I'm sad that Johns' arc is interrupted. However, if this is the kind of fill-in that we're treated to, I will not complain in the slightest. I can't pinpoint a reason why I like this issue so much, but I really enjoyed reading it. I think it's just refreshing to read a nice, two-part story that won't have huge lasting impressions for Superman. Sure Redemption is a throwaway villain, but I can accept that sometimes. This story also has a really nice balance of supporting cast. We see Lois, Perry, and Jimmy, yet none of them overpower the story. Clark's job is used as well, which is something that does not happen nearly enough for my tastes. I will say that initially I was not a huge fan of the religion angle of this book, just because the hero worship idea has been done before, but I feel like it was handled well in this book. I don't like story delays any more than you do, but if this is how DC will handle them, I can definitely deal with them. Art - 4: And again they really come through on the fill-in front. I made it about three pages into this issue before I had to turn back to the cover to see who the penciller is because it was so good. There's nothing particularly original about it, its just a really good, clean art style. I've never heard of Goldman before, but DC needs to give him a regular book quickly. His best work is with Redemption. Every time he uses his powers, the art is just fantastic. There's a great attention to detail in everything too, especially in the background scenery. A few panels are a little awkward, and Clark is bigger than Superman is when he's laying down with Lois, but overall this is a really well drawn book. Cover Art - 2: The one low point of this issue is the cover. They really should have let Goldman do it as well, because I'm really not crazy about the art we got. Superman's face is extremely weird looking, and the whole composition of the cover just isn't working. These covers where they superimpose a large Superman over something else happening never, ever turn out well. 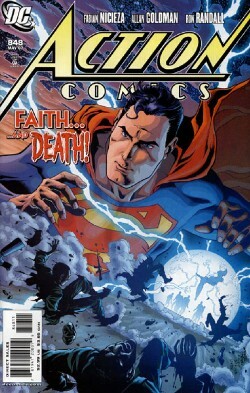 This should just have been an image of Superman fighting Redemption, rather than this incredibly forgettable cover.